This is something we think about a lot. After all, answering this question well leads to acquiring new customers, while responding poorly sends potential customers fleeing for whichever competitor they’re comparing us to. But it’s challenging to compare Ahrefs to the competition. We are an “all‐in‐one” SEO tool and, as such, there are just too many things to compare. So instead of filling out those classic “us VS them” comparison tables, we decided to do something a little different and showcase some of Ahrefs’ unique features and functionalities. You can think of these as our USPs—things that make us stand out from the dozens of other tools with similar functionality. And if you’re wondering why we only have nine points on this list, it’s not because we only have nine unique features. It’s because we wanted to keep this post fairly short, so we only focussed on the major things, rather than exploring every minor detail. There’s a good chance that competing solutions will try to catch up with our USPs, so all statements in this article are unlikely to hold true forever. But I’ll make sure to update it accordingly should anything change. Prefer video? You got it. FYI, that’s 211% more than our closest competitor shows. But that’s just one example, right? What about other keywords? That’s 257% more keywords than the competition, on average, across these five keywords. Are you wondering where I plucked such a bizarre selection of test keywords from? I used a random word generator. These were the first five keywords it kicked back. Hardly surprising, when you consider the fact that we have the largest keywords database on the market today. We’re determined to keep it that way, too. The numbers above are only for the United States. But our keywords database contains more than 6.1 BILLION keywords across 170 countries. None of our competitors can do this. In fact, our closest competitor only shows keywords across 92 countries, which is almost half as many as Ahrefs. Here at Ahrefs, we add new keywords to our database every single month. We use clickstream as one of our main sources of this keyword data. Any keywords that we haven’t seen before will make it into our Newly discovered report in Keywords Explorer. This report is super‐useful for making sure you’re first to know about any new or trending searches in your niche. You can see why people were Googling this. That’s a 59% drop in just one month! Please keep in mind that clickstream data is collected from a relatively small subset of the online population, so it may take a bit of time before some search queries appear in this report. The fact that the keyword was “newly discovered” by clickstream providers doesn’t necessarily imply that the actual search query is brand new. Still, it’s the best data on fresh search queries that the industry has to offer. This is one of my favorite Ahrefs’ features, and I’m honestly surprised that it’s still unique to us. 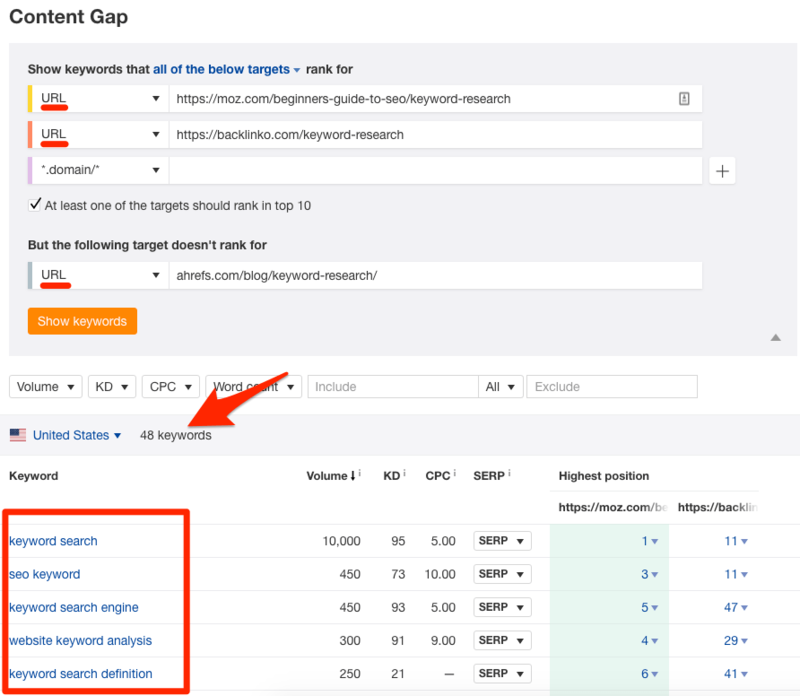 Enter any search query (no matter how bizarre it is) into Keywords Explorer and we’ll pull the top‐ranking search results, along with an estimate of how much monthly organic search traffic they each receive. 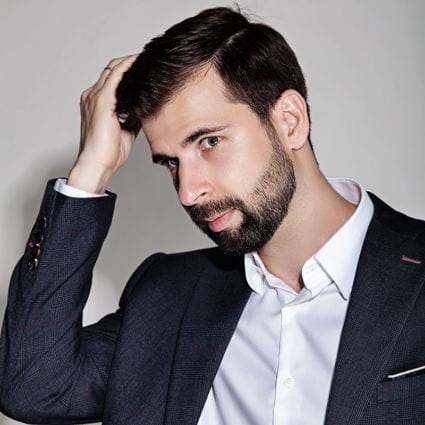 So we can see that our list of 75 SEO tips ranks in position #4 for “seo tips” and receives an estimated 896 visitors from Google every month. But this isn’t the total estimated traffic to the page. It’s the estimated traffic only from the country you’re viewing the SERPs for (the United States, in this case). It’s dropped to 144 estimated monthly visits. That’s because these are from the UK only. Want to see the traffic estimate for all countries? Just hit the caret next to the URL. This “SERP checker” functionality is integrated across all tools in Ahrefs, so this information will always be at your fingertips. I love this little feature so much that I pretty much dedicated an entire article to it. The gist is this: why obsess over the search volume of an individual keyword when a single page usually ranks for thousands of related search queries and attracts search traffic from all of them? Not only does Ahrefs show you all the keywords that a given website, URL or even subfolder ranks for, you can also see the ranking progress for any single keyword. 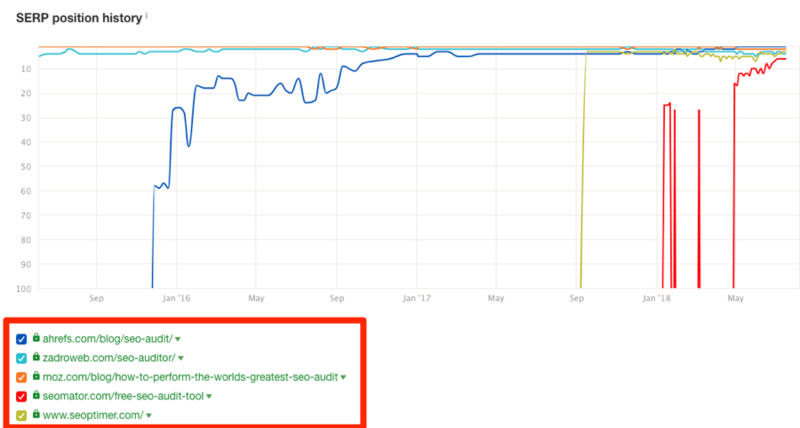 But here’s the unique part: below the graph, you’ll see a list of all the pages on your site that have ever ranked for a target keyword. This is handy for finding pages with similar content that could be consolidated into a single page. 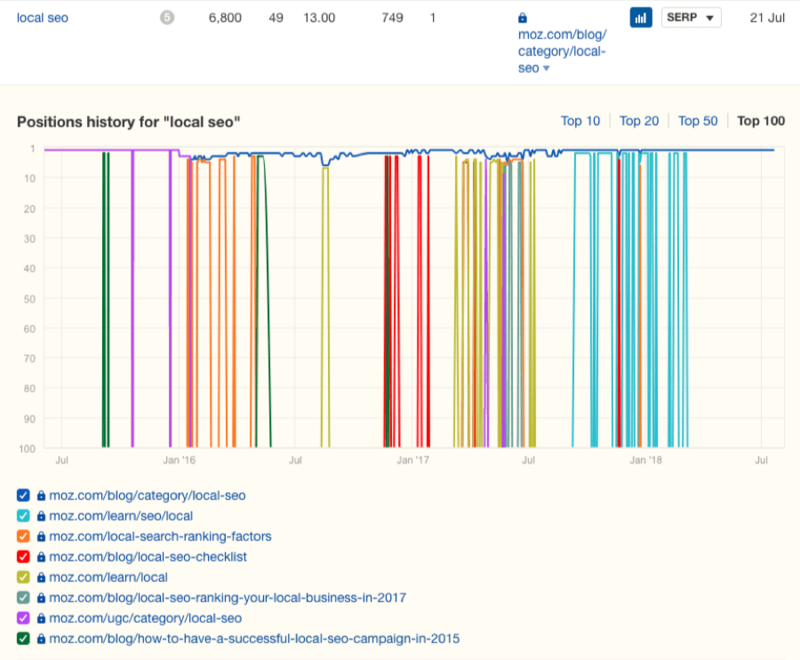 Eight of their pages have been seen ranking for “local SEO” over the years—these could surely be combined into one kickass guide. 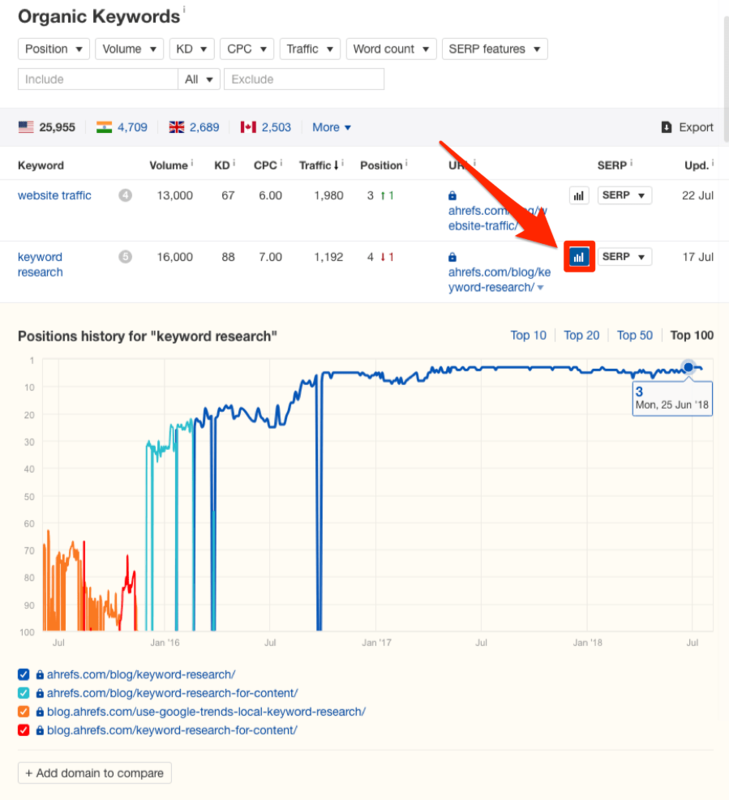 Now let’s go back to the “positions history” report for “keyword research” and I’ll show you another cool feature: the ability to compare your keyword rankings to those of another domain. 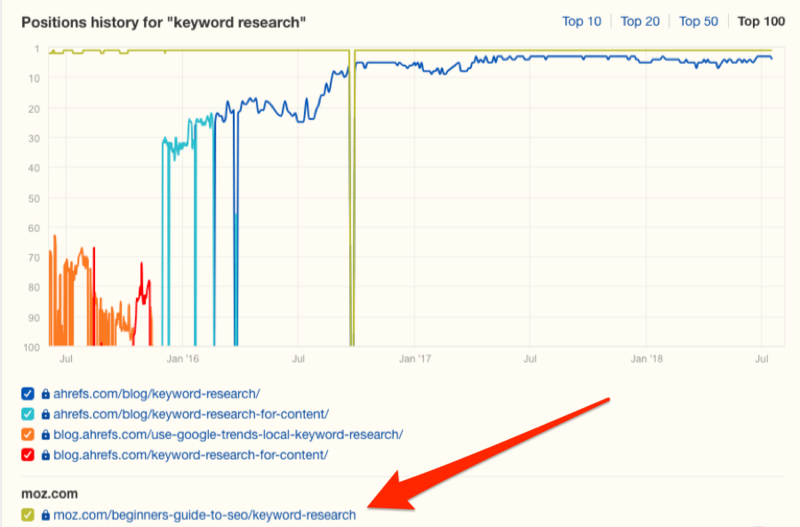 Let’s see how we fare in the SERPs for “keyword research” compared to moz.com. Did you know that we also show the ranking history graph in Keywords Explorer? It just works slightly differently than in Site Explorer, as we show the ranking history for the current top five ranking pages, rather than the ranking history for pages on the site you’re analyzing. You can see that although one of the top‐ranking pages comes from ahrefs.com, the rest are pages on other websites. This graph is super‐useful for checking SERP volatility. If the top‐ranking pages for a particular keyword are always jumping around and changing, then it may indicate that Google is unsure what the searcher is looking for. “Football” is an excellent keyword to demonstrate this. You can see that the top‐ranking pages are constantly changing, which indicates that Google is struggling to understand searcher intent. But why is this? I mean, football is a pretty clear‐cut keyword, right? Not really. Football means different things depending on where you live. The game that British folk call football is the same game that Americans call soccer. 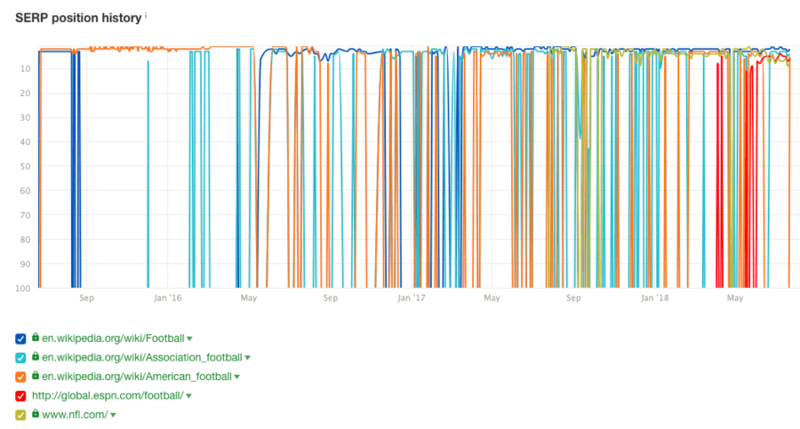 This appears to be the reason for Google’s confusion—it’s ranking Wikipedia pages for the different types of football, but keeps switching them around. SERPs like this are sometimes easier to break, but rankings can be short‐lived. 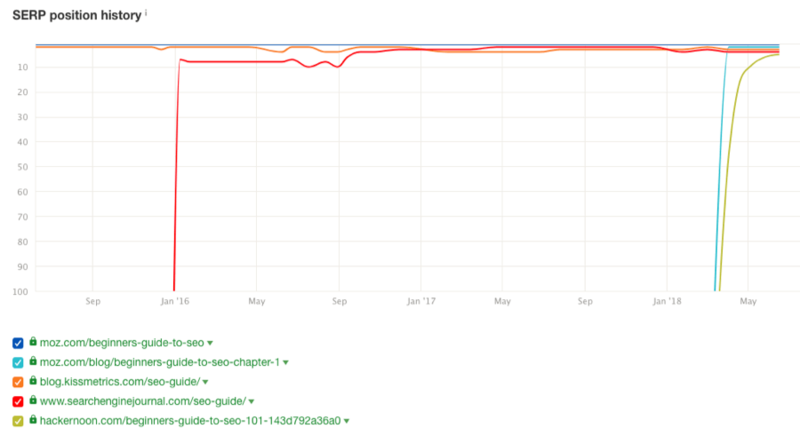 On the other hand, if you see that the top‐ranking pages are pretty stable—and have been for a while—then the keyword may be more difficult to crack. Yes, there are some newcomers. But overall, the top‐ranking pages are a lot more stable. Also, it’s somewhat difficult to see in that screenshot, but the infamous guide by Moz has been consistently ranking in the top spot for over three years. This clearly shows that this is an informational search where searchers are seeking a comprehensive, noob‐friendly guide to SEO. So, this SERP would probably be easier to crack because the search intent is super‐clear, meaning that it’ll be easier to give Google what they want. But I still don’t fancy anyone’s chances at knocking Moz off the top spot anytime soon. 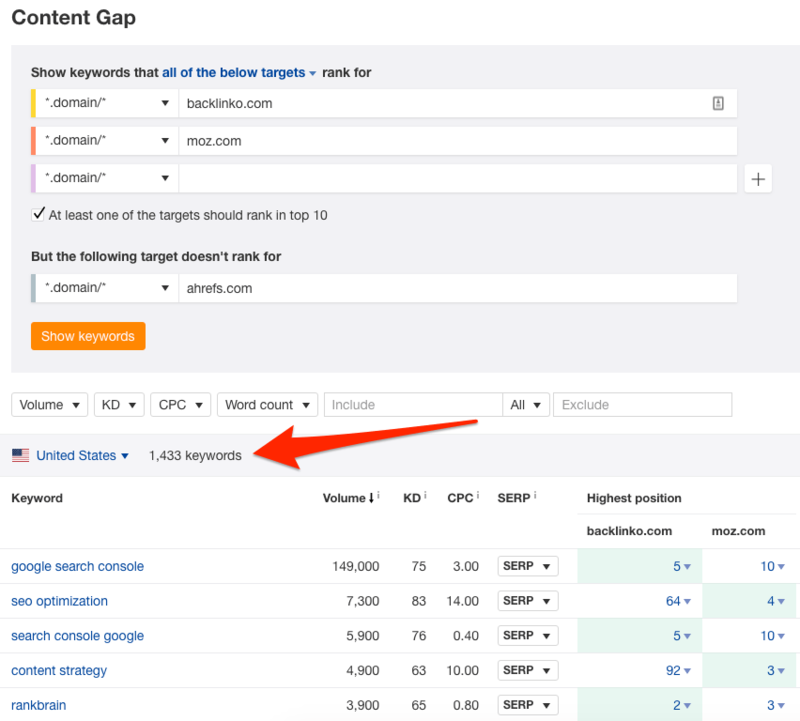 Let’s say you wanted to see all the keywords that moz.com and backlinko.com rank for, but ahrefs.com doesn’t. You could do this by exporting the Organic Keywords report for each site from Site Explorer, loading them all into a spreadsheet, then applying some spreadsheet magic. But for those of us who aren’t spreadsheet wizards, this can be a difficult task. 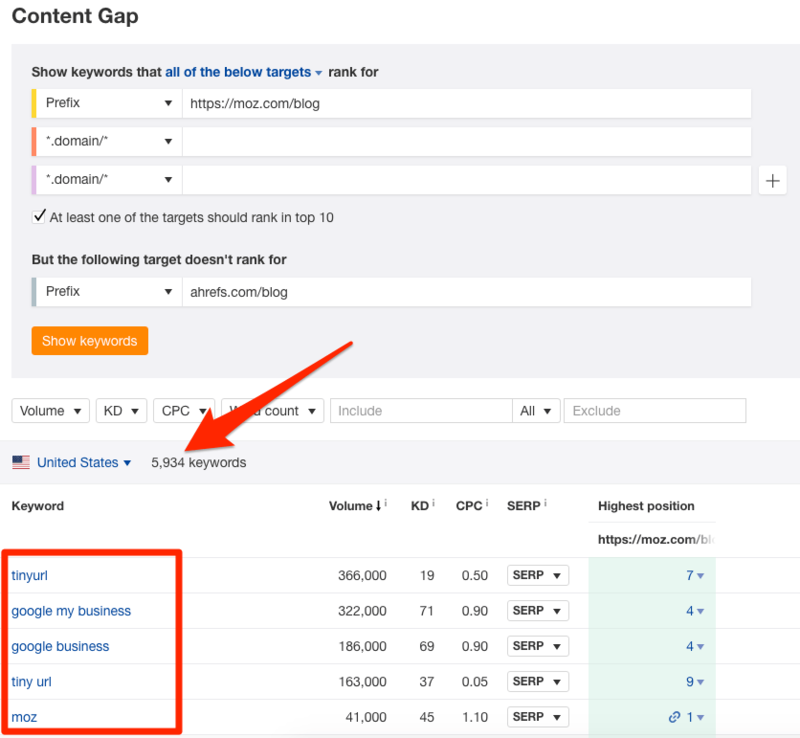 via the Content Gap tool in Ahrefs Site Explorer. Many of these seem like good topics that we could write about on the Ahrefs Blog, and it took me less than a minute to find them. You can compare up to 10 sites here, which is more than any other tool allows. But while the ability to find content gaps between domains isn’t unique to Ahrefs, doing the same thing at the page or subfolder‐level definitely is. Let’s see which keywords the Moz blog ranks for that our blog doesn’t. Not sure which pages are competing with you? Paste a page from your website into Site Explorer, then go to the Competing pages report. This kicks back the pages with the most significant keyword overlap in the SERPs. 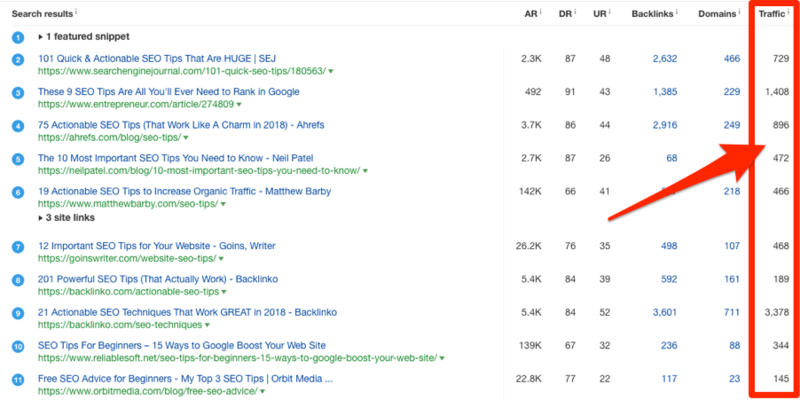 If you’re looking for a way to boost the “relevance” of your page in the eyes of Google, consider sprinkling some of these keywords—the ones that competing pages rank for, but you don’t—into your content. Who knows? Maybe the absence of these few relevant phrases is part of the reason you’re not ranking in the first place. This one is much more powerful than the title suggests. Content Explorer is like a mini search engine within Ahrefs. You can use it to search our content database (containing almost 1 BILLION web pages) for mentions of any word or phrase. How is that useful? Don’t worry; we’re getting there. No other tool brings these data points together under the same roof, which is probably why we’re using this tool a lot in Ahrefs’ marketing department. And I mean a LOT! Because if the blog mentions any of these keywords, it’s clear that they write about related topics. And if they write about related topics, they may be open to accepting a relevant guest article from you. Exclude results from your domain by appending -site:yourdomain.com to your search. You’ll notice we did this in the screenshot above. But Content Explorer kicks back pages, not domains. Tick the “one article per domain” box to filter the results for unique sites. If you’re still left with too many results to sift through, add a Domain Rating (DR) filter, which is a good measure of a website’s popularity. You may also want to use this to filter for sites that you feel comfortable writing a guest post for (lower DR sites typically have lower content standards, so it tends to be easier to get published there). Having done this for our search, we’re left with ~8K results. Now it’s just a case of reaching out to any sites on this list for whom you wish to write a guest post. 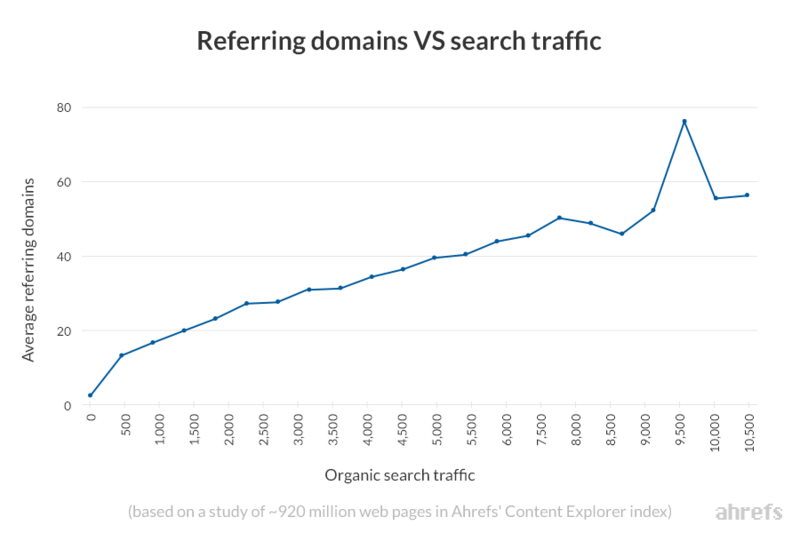 There’s a definite positive correlation between the number of referring domains to a page and the amount of organic search traffic it receives. Translation: if you want lots of traffic, you’ll usually need a decent number of referring domains pointing to your page. But this isn’t always the case. Some pages attract a ton of traffic without any referring domains. If only you could find such pages, it might be possible to see which keywords they’re ranking for an outrank them, right? That’s precisely what you can do in Content Explorer. 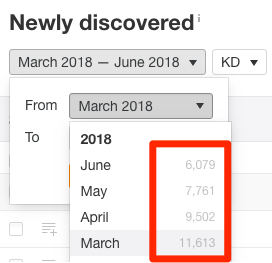 You’ll now see all the pages related to your topic that receive at least 500 organic visits per month AND have five or fewer referring domains. If we hit the “Details” caret and view the Organic keywords for which it ranks, we can see that it currently ranks #6 for “how to see youtube tags”—a topic with 1,500 monthly searches. This looks like a super easy keyword to rank for, and it would almost certainly send some decent traffic. And yes, this tool is unique to Ahrefs only. I foresee some readers saying that Content Explorer is not unique, because there’s a well‐known tool called Buzzsumo. However, Buzzsumo is focused on the social aspect of web content, while our tool focuses on SEO, which makes them quite different. You can’t do the things mentioned above with Buzzsumo. Do you accept guest posts on your website, or allow user‐generated content? Then it probably pays to keep an eye on where those people are linking. Too many links to questionable or toxic websites can have a negative effect on your site. With the Outgoing links reports in Site Explorer, you can do exactly this. Let’s try it for ahrefs.com, starting with Outgoing Linked Domains. Not only does this show you all of the domains you’re linking to, but it pulls in a bunch of useful metrics alongside them: Domain Rating (DR), number of dofollow links you have to each site, and even estimated organic traffic. Sorting this list by DR in reverse order will usually help you to spot questionable sites. Use the search box to find linked‐to domains containing suspicious language quickly. Looking at this report can also be useful if you suspect that you might have been hacked as hackers often inject toxic links into sites. Now let’s take a look at the Outgoing Broken links report. Broken outbound links are never good news as they contribute to a poor user experience. So it’s worth fixing these should you find any. Last but not least, Ahrefs is the only tool that has a beautiful historical graph of the referring domains pointing to any website over time, which goes back as far as 2013 and is updated daily. You can see that it’s been growing steadily over this time. In fact, Brian has taken the site from zero to more than 12K referring domains over this period—that’s an average of 200 new RDs per month! Matthew’s blog got a huge spike of new links in mid‐2014, but they seemed to disappear by 2015. 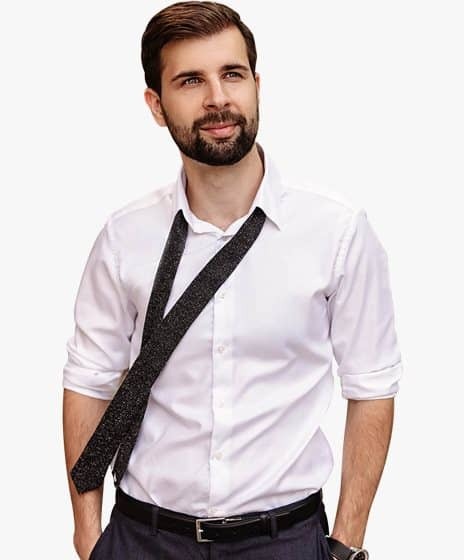 We reached out to Matthew, and he confirmed this was due to an SEO attack. You can’t go that far back in time with the referring domains graph in any other tool. Ahrefs has many more unique features and data points. For once, I haven’t even mentioned anything from our Rank Tracker and Site Audit tools, which have quite a few unique features that other similar solutions don’t have. But maybe I should write a follow‐up to this article and showcase more tools/features that only Ahrefs can do? What do you think?